A user-friendly interface makes your MyHealth Clinic experience easier, simpler and accessible in one application. 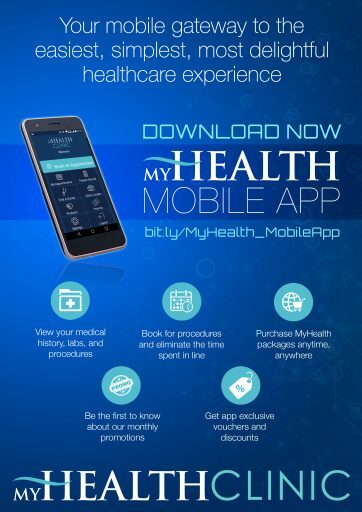 Medical Care with the MyHealth Clinic app in the palm of your hands. The MyHealth Mobile App allows patients to view their medical records, check complete doctor schedules per clinic branch. It also allows patients to book and pay for medical appointments, saving them time from having to queue and access to exclusive app discounts and promos. Download and register in the Mobile app and get P100 off ALL laboratory packages, both in-app and in-clinic. Just show your mobile receipt download email upon payment to avail of the discount in-clinic.